Everything Just So: How Do You Like Your Skirt? How Do You Like Your Skirt? A Valentino skirt for Fall/Winter 2014. Photo by Yannis Vlamos. There are so many skirt options these days it really feels like you can decide what the best shape is for your figure and somebody, somewhere, is probably making and selling that exact skirt, in a variety of colors and fabrics. When the weather starts to warm up I will be thinking of longer and A-line skirts, which are so easy and fun. 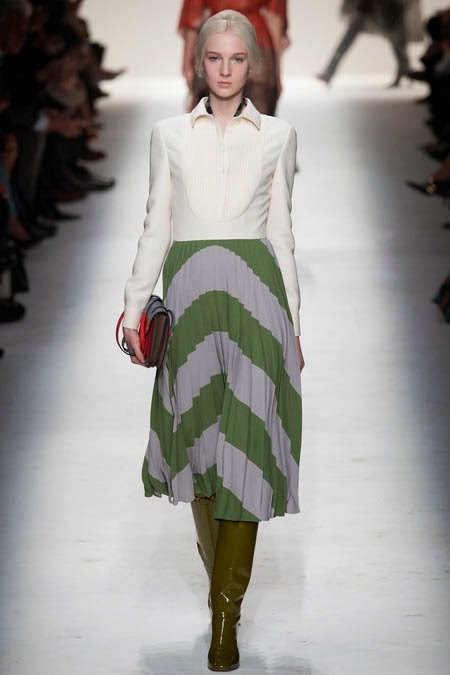 The Valentino skirt, above, is actually a piece from the Fall/Winter 2014 collection, but it seems to me that you could wear that pleated and chevron-striped beauty right now! I also like the white Michael Kors skirt suit he showed for Spring/Summer 2014, which I would love to live in all summer long, it looks that comfortable. From the Spring/Summer 2014 Michael Kors show. Photo by Yannis Vlamos. As soon as it gets hot I will again be pulling out the black eyelet skirt I made a couple of years ago. It really is a good skirt for summer. The black eyelet skirt I made, from a post last August. When it’s cold, though, like it still is in NYC, I prefer either pencil skirts or ankle-length skirts, both of them on the tight side to get that long and lean silhouette. L’Wren Scott, who has been on my mind so much this past week and a half, did skirts so well. I always loved her take on a pencil skirt, and this one, from her final collection for Spring/Summer 2014, called “Tagasode,” is no exception. Look at the color, look at the sequins! I will be writing more about L’Wren in an upcoming post. A skirt from L’Wren Scott’s last collection. Photo by Yannis Vlamos. Consider this your friendly reminder that Adrienne of The Rich Life (on a budget) and I are accepting pictures for “How I Wear My: Skirt” until March 31, 2014. Find your favorite skirt and join us! Send photos to howiwearmy@yahoo.com. I was so very shocked to learn about L'Wren Scott! Terrible. Just terrible. Thank you for reminding me to send you a photo. I am a huge lover of skirts so I must have some photos somewhere. I love her designs...such a loss. Her skirt here is gorgeous. I hope to send you something Jill...but still not certain if I will be able to...you are on my radar! I don't tend to wear skirts often. Maybe this season I should try again there are some great ones around. I love that black eyelet skirt! Even better that you made it yourself. I would love to have a plain bias cut black linen skirt for Summer but no luck so far.